Lots of SDK changes: dart:dom was removed and several libraries moved from dart-sdk/lib to dart-sdk/pkg. During a rename refactoring, if there are potential references to a field or method, we will warn the user and display a preview dialog. Using the old catch syntax is now an error. 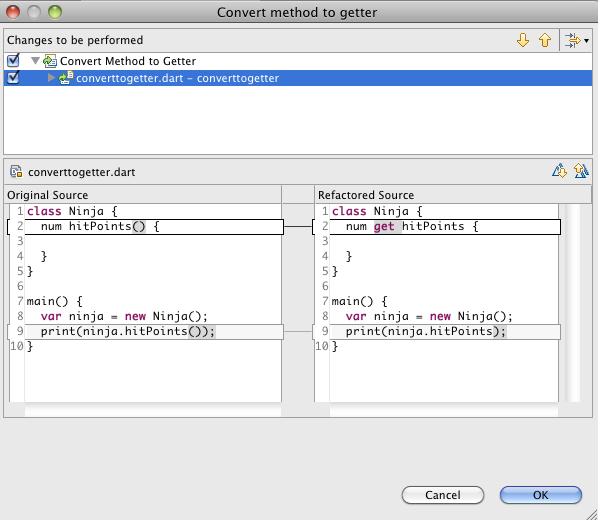 We have a new "Convert Method to Getter" refactoring. We no longer report 'no such method' warnings if class defines 'noSuchMethod()'. We added a Quick Fix to create a library import for unresolved functions and fields. The warnings we create for inferred types are now displayed differently from other errors. You can view them by hitting the 'show informational messages' button in the Problems view. Fixed an issue where our search box would not consistently show SDK types. Several miscellaneous debugger UX improvements, and 11 analysis issues fixed. As always, view the changelog for the full list of changes, and to get started with the Editor see our tutorial.